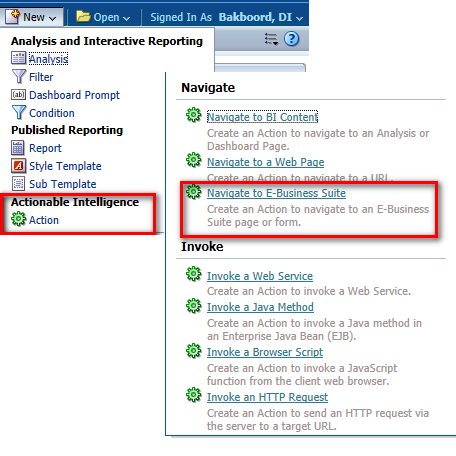 One of the interesting features of Oracle BI 11g is the Action Framework. This feature makes it possible to e.g. navigate from Oracle BI 11g to Oracle eBS R12. 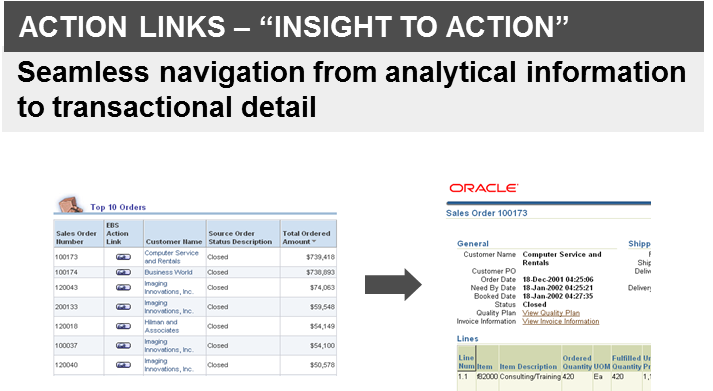 When you have a look at the different Oracle BI(A) presentations from Oracle you will see a slide regarding Action Links ‘Insight to Action’. It looks like this is standard Out-of-the-Box functionality. This is partly true. You should have at least the Oracle BI 11g & Oracle eBS R12 integration in place. Next to that there is some additional configuration / implementation required. After you have modified the ActionframeworkConfig.xml file, you have to restart the Managed Server in Weblogic that is hosting your Oracle BI EE environment. I – the Application Role must have privileges to execute direct database requests against the Oracle eBS Connection Pool. II – for the Application Role (responsibility) to successfully invoke a Navigate to E-Business Suite action, the target Oracle eBS function must be accessible from the user’s current Oracle eBS Context. If you want to navigate to a query the form you are navigating to, you should identify the Oracle eBS Form Parameter. This can be achieved by the following steps. We will use the name of the Form to identify the possible parameters of this Form. In this case; APXINWKB. The Function Code will be used later on when creating the actual Action Link. You can download the related .fmb-file from the Oracle eBS Application Server in the following location; $AU_TOP/forms/NL. The ‘NL’-part refers to the language. Now everything is in place to create the actual Action Link. With this Action Link it is possible to call this link directly end fill in the Invoice Id yourself. 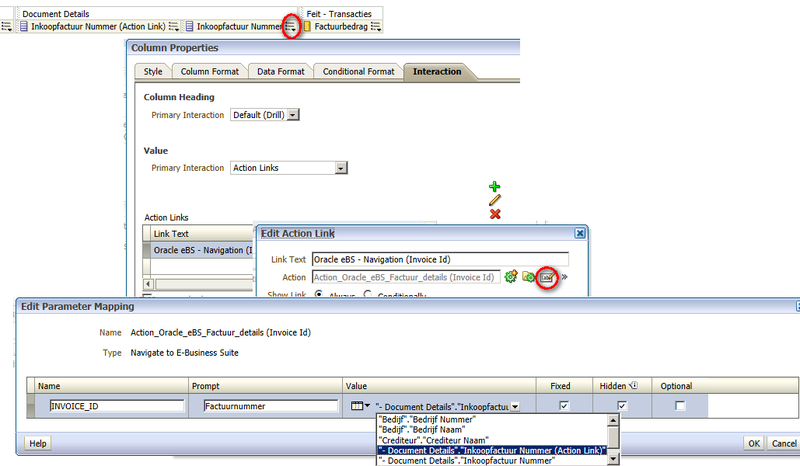 Another option is to make the Action Link part of an Oracle BI Answers Request. Select and edit a column in an Oracle BI Answers Request. Navigate to the Interaction Tab. Here we can add / edit an (existing) Action Link. I have chosen to use a Invoice Number with an Action Link which uses a hidden (Invoice Id) column to navigate to Oracle eBS. This way I do not have to show the Invoice Id in the Oracle BI Answers Request. Still I can use the Invoice Id as a parameter in the Oracle eBS Form. It’s a little bit of work, but still it’s a nice feature. Many thanks for your help. We have fix our issue to connect to EBS from BI. However, I am facing a new issue because we need to connect directly from BI to “submit: Request” Function. That means we need to go directly to EBS-FORM Run concurrent request. Do you have any idea how to run it? This is a long time ago. You should check the privileges, via the web; Administration, Security, Manage Privileges, Admin: General, Issue SQL Directly. Next to that you can double-check the permissions on the General tab of the Connection Pool via the Administration Tool. Have you ever get this kind of FRM-47023 FRM-40105 FRM-47024? When you try to pass the parameters from the action link to the oracl ebs form ? I did the SSO integration and i dont have problems. I haven’t tried the same in an Oracle eBS 11.5.8 environment. As far as navigating from Oracle eBS 11.5.8 to Oracle BI, there is some Oracle eBS patching involved. I am not sure whether the same applies from Oracle BI back to Oracle eBS 11.5.8. Apart from the patching, I don’t see any reason why it wouldn’t work. Can the same process also enable and link from OBIEE back to EBS 11.5.8? Thanks Dan. Restarting the managed server solved the problem. Thanks a bunch. Thanks for the feedback. I have updated the post. I checked the doc 1457278.1 . I entered the ebusinesssuite tag after accounts tag. However there are two ActionframeworkConfig,xml . Should i make changes in both the files ? Do we need to restart any OBI services after making the changes ? I am on OBIEE 11.1.15 version. After you have modified the ActionframeworkConfig.xml file in ORACLE_MIDDLEWARE_HOME/user_projects/domains/bifoundation_domain/config/fmwconfig/biinstances/coreapplication, you have to restart the Managed Server in Weblogic that is hosting your Oracle BI EE environment. I followed all the steps but still ‘Navigate to E business Suite’ link does not appear in OBIEE 11G. SSO is configured and i am able to login through EBS to OBIEE and users have access to execute direct database request. Is there any other configuration that needs to be done. Have you checked Oracle Support; Doc Id 1457278.1?